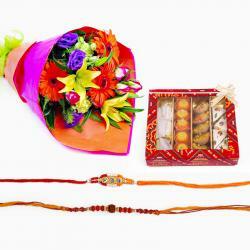 Deliver Same Day Colourful Rakhi with Fresh Flowers Hampers online anywhere in India at reasonable price from Giftacrossindia.com and surprise your dear brothers. Flowers are symbol of love and purity without flowers all ritual and puja is incomplete so complete your Rakhi gift with fragrance flowers. 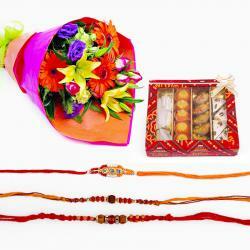 Sending Rakhi with flowers is the simple and best idea on rakhshabandhan. 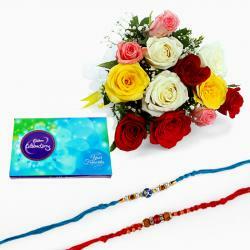 Your brother will definitely like the colorful flowers as a rakhi gift on this ocassion and feel special and delighted. 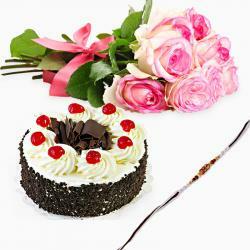 We have varities of flowers available in our site like roses, lilies, gerberas, carnation of different colors. 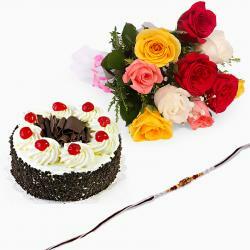 Flowers are the only reason to cheer up someone on any ocassion. 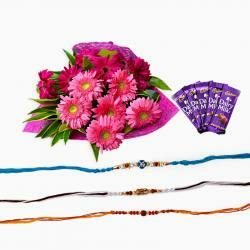 Choose varities of flowers from our widest range of rakhi with flowers category which will give a lot of option to send it to your derest brother on this rakhi. We have the collection of flowers like elegant lilies, lovable roses, peaceful carnations, blooming gerberas, daring orchids which has its symbolization. Sometimes beauty can also be gifted. Flowers are the beautiful gifts that you can send it to your loved ones on any ocassion. 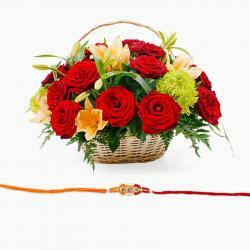 Send these fresh fragrance of love to your dear brother residing in any part of the country. 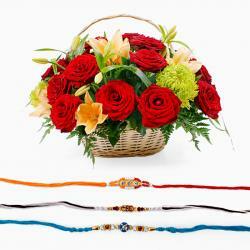 You will get rakhi with flowers in affordable prices at Giftacrossindia.com . 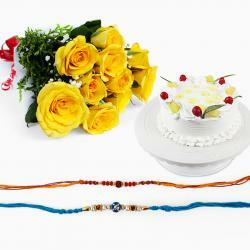 Bring a smile on your brother’s face by sending this charming rakhi with flowers.You can now gift zardosi rakhi, silver rakhi, mauli rakhi, pearl rakhi etc with your favorite choice of flowers. 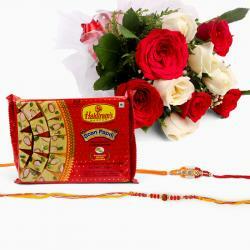 Rakhi with flowers is the best gift to share love and care on the auspicious ocassion of rakhshabandhan. So do not forget to share and care..! !